The New Waypoint Coastal single tube is a new approach to small boat safety. Built with the same high quality materials as all of our other models, it is the best value for money safety items on board the small boat. It will safely carry 2, 4 or 6 adults, keep them dry and warm until rescue arrives. The only single tube liferaft worldwide, which features a self erecting canopy. · European built in Waypoints OWN factory from fabric and parts made in Europe. · ISO 9650-3 Fabric. PU coated nylon H.T 6 6 laminate (almost indefinite life). The very same fabric that they use on their ISO 9650-1 liferafts. Made in the U.K.
· SOLAS approved and ISO 9650 inflation system throughout the liferaft, made in Europe. · Super lightweight construction from 9.5 kilos in a valise. · Single tube construction with self erecting canopy. · 2 large, (75 litres each) water ballast pockets underneath, make it extremely stable when boarding and in rough sea conditions. 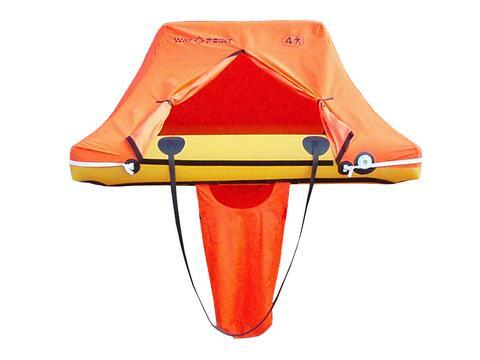 · Bright Flo orange self erecting canopy fitted on a bright yellow tube that can be spotted easily out at sea. Fully enclosed entrance to protect you from the elements. · All packed shortly before dispatch, in Waypoints UK facility, offering to the end user a full 2 year use before servicing. · 2 year service at a low cost.